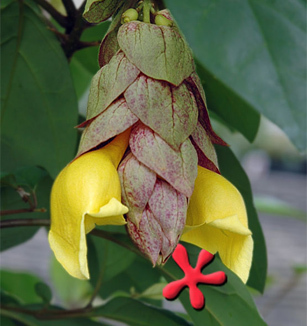 Parrot's Beak, or Gmelina, pronounced with a silent G, is an extraordinary round and spiny tree. The leaves vary from oval to ivy or "duck foot" shape. It has exotic flowers which are comprised of yellow blooms which emerge at the end of a tube-like structure of overlapping bracts. The flower resembles a Parrot's Beak, hence the name. The flower pod has one seed. The fruit is fleshy, smooth, yellow, pear-shaped and about 2 centimeters long. Parrot's Peak is native to the Philipine Islands, India and Southeast Asia. Cold tolerant to lower 30s, it can become deciduous in colder weather. 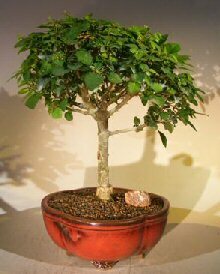 10 years old, 13" - 15" tall.